Opening weekend $26.068 million on 2610 screens. Welcome to stop two on the 2002 Robin Williams Image Rehabilitation Tour. Originally known as a wired and edgy comedian, more dramatic roles in sappy flicks like What Dreams May Come and Jakob the Liar took Williams away from that sensibility. People started to think of him as sentimental and drippy, so I guess Williams figured he needed to alter that mentality. 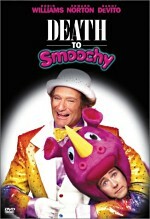 For his first step, Williams played a comically corrupt kiddie show host in Death to Smoochy. That attempt didn’t take. Despite much excellent talent behind it, Smoochy flopped with critics and audiences. However, at least we got to see Williams show some bite for once. His role in Insomnia takes a different turn, but unfortunately, I can’t say too much about it or I might drop some spoilers. Actually, I’ll find it tough to cover the plot of Insomnia in depth because of potential spoilers, so I’ll keep my synopsis brief. 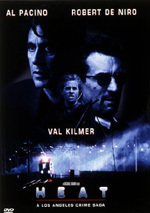 At the start of the film, Los Angeles detectives Will Dormer (Al Pacino) and Hap Eckhart (Martin Donovan) travel to Nightmute, Alaska to investigate the murder of a 17-year-old girl. The local team includes Chief Charles Nyback (Paul Dooley), an old friend of Dormer’s, and Detective Ellie Burr (Hilary Swank), a fresh-faced young cop who knows Dormer’s work intimately. Essentially the film follows three lines. On one hand, it acts as a straight look at the murder investigation, but in addition, we see two elements that affect Dormer. Back in LA, Internal Affairs breathes down his neck due to some alleged indiscretion on Dormer’s part, and the tension increases when they try to recruit Eckhart to testify. In addition, it never gets dark at this time of the year in Nightmute, and that slowly gets to Dormer, who develops insomnia. 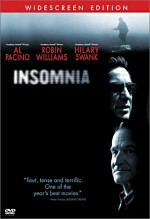 Although Insomnia starts as a fairly direct detective story, the other elements begin the dominate as it progresses. Eventually the crime narrative declines and the tale more firmly focuses on Dormer’s character, especially as his psychological functioning disintegrates under the various pressures. This puts more emphasis on Pacino than one might normally see from this sort of film. Most detective stories remain fairly heavily focused on plot, but that doesn’t really happen here. 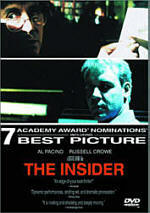 To be sure, the movie explores the crime and the investigation, but it doesn’t dominate. Pacino ably handles the role of Dormer and all of the changes through which he must go. We believe him as the hotshot detective who takes change of the investigation, and we also accept his slow disintegration and trauma. Pacino tosses out the occasional “hoo-ah” moment that distracts from the character’s nuances, but overall he creates a vivid and rich personality. Actually, all of the actors seem good. Swank seems notable, as she makes a lot from an underdone role. In her hands, Burr seems fresh-faced and eager but not like a Pollyanna, and Swank conveys the growth that occurs as the film progresses. Burr doesn’t get much attention from the script, so virtually all of this happens via Swank’s hands, and she transmits the appropriate tones well. As his follow-up to the sensational Memento, director Christopher Nolan had a lot of pressure on him to deliver something spectacular. He didn’t try to reinvent the wheel and create a non-linear flick like Memento; Insomnia follows a much more traditional arc. Frankly, Insomnia doesn’t match up to the thrills of Memento. That film’s unusual structure wasn’t just a gimmick; it created a taut tale that held up to repeated viewings. Insomnia may remain interesting during another screening, but I can’t say it did a lot for me the first time. Overall, it provides an interesting character piece and detective story, but not much about it excels. While the acting seems solid and the whole package remains professional and compelling, it simply doesn’t reach a higher level to become anything particularly special. Insomnia appears in an aspect ratio of approximately 2.35:1 on this single-sided, dual-layered DVD; the image has been enhanced for 16X9 televisions. As one might expect from a brand-new flick, the picture of Insomnia looked solid. Sharpness seemed excellent. The image always came across as nicely distinct and detailed. I saw no signs of softness during this crisp and well-defined presentation. Jagged edges and moiré effects created no concerns, and the image essentially seemed to lack edge enhancement. A smidgen of light grain appeared at times, but overall, the movie appeared free of any form of defects. Colors came across as natural and vibrant. The movie featured a subdued but accurate palette, and the DVD replicated the tones nicely. The hues always seemed vivid and well-saturated, and I noticed no issues related to noise, bleeding, or other problems. Black levels came across as deep and rich, while shadow detail looked appropriately heavy but not overly thick. Ultimately, Insomnia offered a very positive visual presentation. The Dolby Digital 5.1 soundtrack of Insomnia seemed restrained but appropriate for the material. The forward spectrum dominated the affair. Music showed good stereo imaging, while effects tended to favor general ambience. These created a solid environmental setting that blended together neatly. As for the rear speakers, they usually presented reinforcement of the music and effects. At times, they kicked into somewhat higher gear; the surrounds became more active during dream sequences and underwater shots. Otherwise, the audio remained pretty modest. Sound quality appeared solid. Dialogue seemed warm and natural, and I detected no issues related to edginess or intelligibility. Music came across as appropriately bright and dynamic; highs were clear and crisp, while bass response appeared tight and rich. Effects also showed clean and accurate information, and they packed a good punch when necessary. Ultimately, the soundtrack of Insomnia seemed too modest to merit a grade higher than a “B”, but it worked fine for the material. Insomnia provides a good package of extras. Many of these appear in the Production Diaries domain; assume that’s where we reside until I say otherwise. We start with a most unusual audio commentary from director Christopher Nolan. This running, screen-specific affair takes a different approach. The DVD runs the movie in the order the scenes were shot, and Nolan discusses them in this manner. While I don’t know how useful this approach seems, it does create something unique, and I usually enjoyed the alternate perspective. It tends to make Nolan’s comments more screen-specific than I might like. For a standard commentary, the participants don’t focus quite so strongly on the events, as they might delve into more general subjects and themes. Since the action here jumps through radically different parts of the movie, Nolan often needs to change gears quickly, which makes things a little more disjointed than I’d prefer. Nonetheless, Nolan provides some useful information. He rarely goes silent during this chatty conversation. As was the case with his Memento track, Nolan presents a somewhat dry personality, and the commentary can seem somewhat flat and technical at times. However, he does go over many different aspects of the production, and he offers a good look at the ways the actors adapt to the schedule. It does seem cool to check out the film in the order it was shot. I don’t know if I’d want to see more commentaries like this, but overall the piece includes a lot of details about the shoot and it appears generally enjoyable. Actually, the more I thought about it, the more I liked the idea of watching the film in the order it was shot. Most fans know that movies are done that way, but it’s very cool to actually watch the jumps like this. It gives me new respect for the actors, since they need to alter their demeanors so abruptly from time to time. I still prefer the traditional presentation for a commentary, but I think the ability to see the movie in the order shot seems fascinating. In addition to Nolan’s solo track, we get a scene-specific commentary with actress Hilary Swank, screenwriter Hillary Seitz, editor Dody Dorn, cinematographer Wally Pfister, and production designer Nathan Crowley. Crowley and Pfister sat together, but the other three were recorded individually. This piece offers you the option to listen to the participants one by one or run the different commentaries all together. Happily, the latter option doesn’t force you to watch the entire movie to get the 41 minutes and 23 seconds of content; it skips from scene to scene and omits the dead space. Some may find that to be disjointed, but it sure beats 77 minutes of empty time. The comments seem good across the board. Actually, the three women provide the best material. Though she only appears briefly, Swank offers a few nice notes about her approach to the role, while Dorn helps let us know about the structural choices. Seitz adds solid remarks about the characters and also tells us about some differences between this film and the original version. The guys tend to toss in technical remarks, and they contribute some useful notes, but I preferred the comments from the others. Overall, this track seems positive. For truth in advertising, look no further than 180 Degrees: A Conversation with Christopher Nolan and Al Pacino. The 17-minute and five-second piece offers exactly what the title describes, as it consists solely of a chat between the two men. They go over aspects of the movie and other parts of Pacino’s career. The information seems decent but unexceptional. However, it is fun to hear Pacino off-handedly mention other roles and colleagues; that casual name-dropping makes the piece more entertaining. At seven minutes and 55 seconds, Day For Night: The Making of Insomnia is too short to offer a full examination of its subject. Nonetheless, it includes some useful material. It mixes film clips, shots from the set, and interviews with Nolan, executive producer Steven Soderbergh, producer Andrew Kosove, and actors Hilary Swank and Robin Williams. Some of the information seems puffy, but a lot of it digs beneath the surface. The remarks from Williams seem especially insightful. Not only does he toss out a laugh or two, but he also adds some complexity to his take on the role. Short but sweet, “Night” deserves a look. In the Fog splits into two sections. One lasts six minutes, 10 seconds and offers footage and information from cinematographer Wally Pfister, while the second runs five minutes, 45 seconds and includes remarks from production designer Nathan Crowley. Mostly we see raw footage from the set, and the men provide information about those pieces. Though these featurettes seem a little dry and technical at times, I enjoy “behind the scenes” material such as this and think they offer a decent look at the production. That ends the “Production Diaries” department and we return to the main “special features” menu. For some insight into insomnia, check out Eyes Wide Open, a seven-minute and 30-second program on the topic. It includes movie clips and comments from insomniacs Phillip Lacey and Laura Robinson plus UCLA Sleep Disorder Center Medical Director Dr. Frisco Yan Go and Stanford University Sleep Research Center Director Dr. William Dement. The doctors relate the facts of the disorder, while the others discuss their reactions to insomnia. The short show gives us a quick but useful chat about the subject. Next we get one Additional Scene. It lasts three minutes and can be viewed with or without commentary from director Nolan. It shows a short chat between the Pacino and Maura Tierney characters and adds to the character complexity. Nolan’s commentary offers a few details and explains why it didn’t make the finished film. I can’t disagree, but it seems like a nice scene, so I wouldn’t have minded seeing it in the final product. When we head into the Promotional Materials domain, we find two subsections. “From the Evidence Room” includes 28 pictures; these come from the set as well as a poster. You can watch these rapidly with the use of the chapter button or let them play as a video program. We also get the film’s theatrical trailer. Cast and Crew provides filmographies for actors Al Pacino, Robin Williams, and Hilary Swank plus director Christopher Nolan, editor Dody Dorn, screenwriter Hillary Seitz, cinematographer Wally Pfister, and production designer Nathan Crowley. Lastly, DVD-ROM users will discover some links. These go to the Insomnia website, a “Latest Movies” area that details new DVD releases, WB Online, and the usual WB “Special Features” site. They don’t update the latter very frequently; as I write this in mid-October 2002, they list some June DVDs as “coming soon”. You can also sign up for WB’s “Movie Mail” feature here. While Insomnia lacks the impact of Memento, Christopher Nolan’s follow-up film provides a reasonably interesting and unusual mystery. Although it moves along conventional narrative lines, it weaves in and out of audience expectations and ultimately creates a fairly compelling story. The DVD offers very strong picture with good sound and a nice roster of extras. Insomnia didn’t knock me out, but the movie seems worthwhile, and the fine quality of this DVD leads me to recommend it.